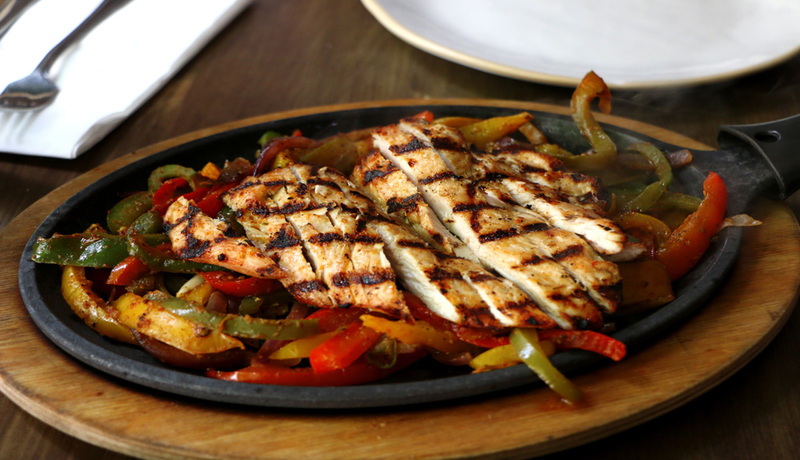 There are many different types of fajitas that you may want to try, so here are a variety of fajita recipes sure to satisfy. 1. Grate the orange and lemon rinds to make a zest. 2. Combine zests with water, pineapple juice and soy sauce. 3. Add spices except black pepper and stir until well combined. 4. Pour mixture into a large baking dish. 5. Remove any membrane from the skirt steak. 6. Place skirt steak in pineapple juice mixture. Turn steak over to make sure that it is well coated. 7. Cover pan with plastic wrap and let sit for two hours. 8. Soak wooden skewers in cold water for 30 minutes. 9. 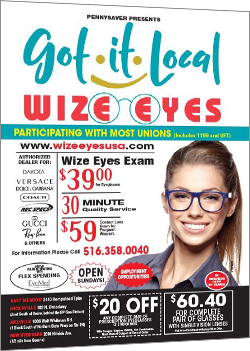 Meanwhile, cut the onion into 1/4-inch slices. 10. Seed and cut peppers into quarters. 11. Place onion and pepper pieces onto skewers. 12. Place olive oil in a shallow bowl. 14. Prepare grill for cooking over hot charcoal or gas per manufacturer’s directions. 15. Put onions and peppers on the grill. Cook for two minutes. 16. Add steak to grill and cook for six minutes. 17. Flip skewers and steak over. 18. Cook all ingredients until done. The steak will take about six minutes. 19. Remove meat from grill and cut crosswise into 1/2 inch wide strips. 20. Remove onions and peppers from skewers. 21. Assemble fajitas and enjoy. 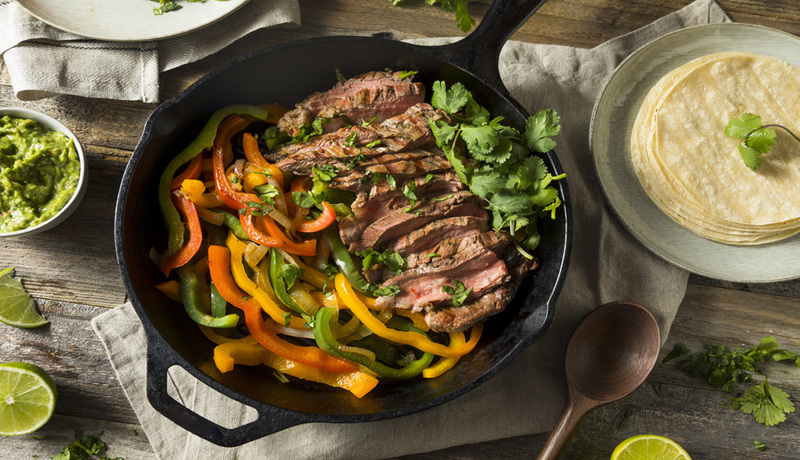 While beef round steak is one of the cheapest cuts of beef you will find at the grocery store, you will never know it when you make Sobroso Beef Fajitas. 1. Slice round steak, peppers and onion 1/4 inch thick. 2. Put all ingredients in a large plastic bag and shake vigorously. 3. Let sit flat for two hours in the refrigerator. 4. 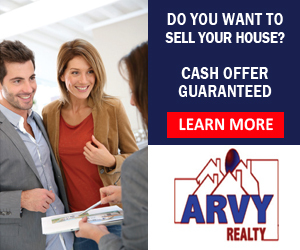 Remove from refrigerator and let return to room temperature. 5. Place mixture in skillet and cook until meat is no longer pink. 6. Serve sizzling hot with flour tortillas. 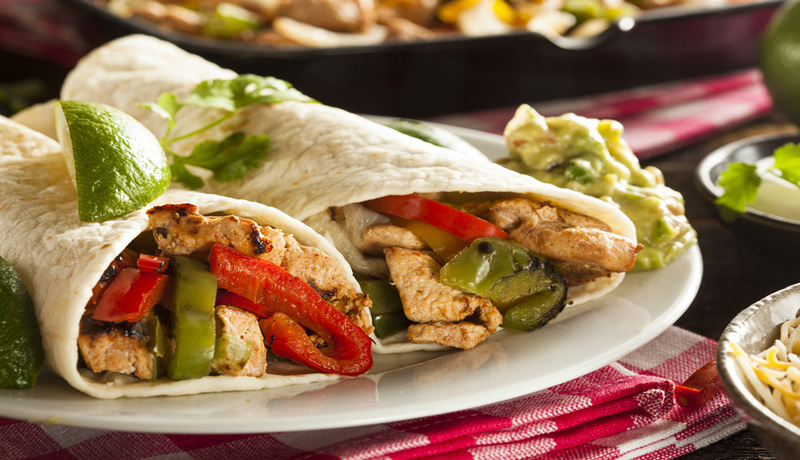 If your family is already yelling that they are hungry, you have not even had time to think about what’s for supper, then make Enérgico Chicken Fajitas and have supper on the table less than 30 minutes. 2. Cover top of the cooking sheet with aluminum foil. 3. Slice chicken, peppers and onion 1/4 inch thick. 4. Place chicken, peppers on cookie sheet. 5. Cover with jerk seasoning and sugar. 6. Sprinkle on pineapple chunks spacing evenly. 7. Wrap tortillas in aluminum foil. Place cookie sheet and tortillas in oven. 8. Bake for 20 minutes until chicken is no longer pink. 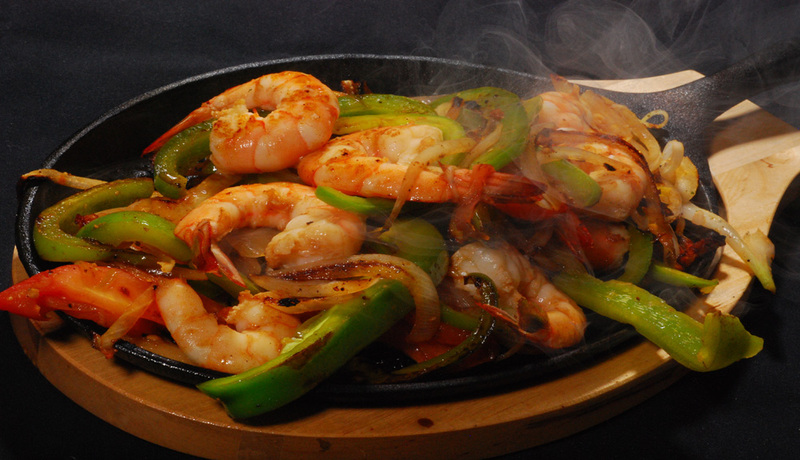 The secret to making delicious Tequila Shrimp Fajitas is marinating them for at least four hours. 1. Place shrimp in large plastic bag. 2. Thinly slice and add peppers and onion. 3. Add remaining ingredients reserving 1 tablespoon olive oil. 4. Lay flat in the refrigerator for at least four hours up to overnight. 5. Remove from refrigerator and let come to room temperature. 6. Put reserved tablespoon olive oil in skillet. 7. Drain shrimp mixture and add to skillet. 8. Cook over medium heat stirring frequently until the shrimp are no longer pink and cooked through. 9. Assemble fajitas and enjoy. 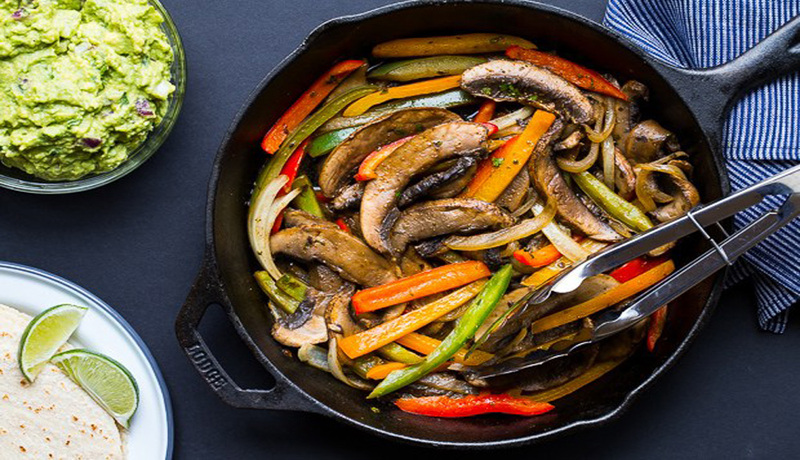 Portobello mushrooms combine with chipotle seasoning to give this recipe a unique flavor that your family will adore eating this meatless meal. 2. Slice mushrooms, peppers and onions thinly. 3. Combine and place on a baking dish with a rim. 4. Combine fajita seasoning, chipotle seasoning and sugar in a small bowl. 5. Pour olive oil over vegetable mixture. 6. Sprinkle seasoning mix over mushroom mixture. 7. Toss to coat with seasonings. 8. Place baking sheet in oven to roast for 20 minutes. 9. Remove from oven and stir. Return to oven and cook for another 20 minutes. 10. Wrap tortillas in aluminum foil and warm in the oven for last 10 minutes. 11. Remove baking sheet and tortillas from oven. Cut lime in half and squeeze juice over mushroom mixture. 12. Assemble fajitas and enjoy. 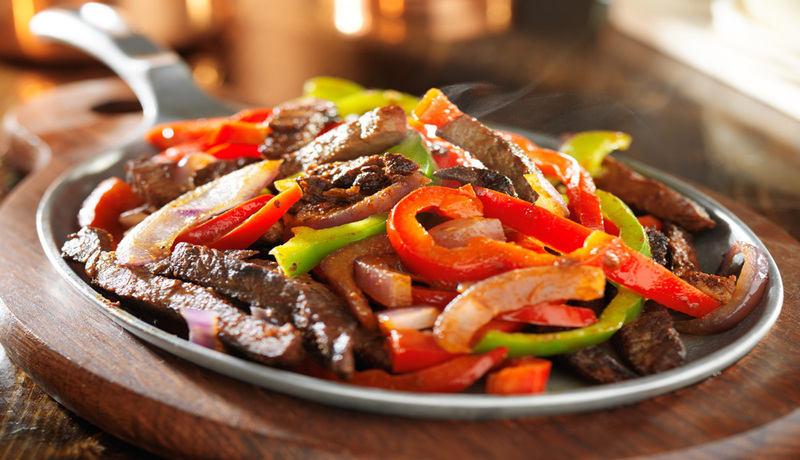 You will enjoy eating fajitas often because of the many ways that they can be prepared. Serve them often as they are a great upscale meal that can easily be prepared at home.